Former Hambantota District MP Namal Rajapaksa says he will be joining the Sri Lanka Podujana Peramuna (SLPP) with immediate effect. He also says that they will form a “broader coalition” under the leadership of President Maithtripala Sirisena and Prime Minister Mahinda Rajapaksa to contest the upcoming General Election. “I am joining the Podujana Party effective immediately,” Rajapaksa said in tweet today (10). 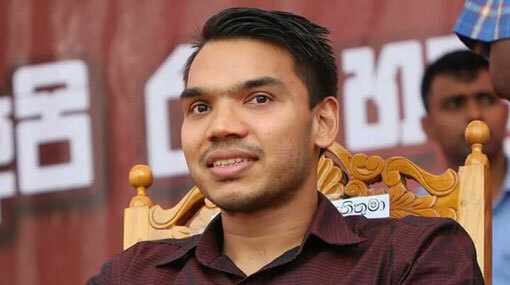 A member of the Sri Lanka Freedom Party (SLFP), Namal Rajapaksa had contested the previous general election under the UPFA ticket from the Hambantota District. A Gazette notification signed by the President announced the dissolution of parliament effective at midnight yesterday. The notice said the names of candidates for new elections will be called before 26 November, and the election will be held on 5 January. The new parliament is to be convened on 17 January.